Perhaps you see this as half full partly due to the fact that it did not cost you 10's of thousands of dollars out of your pocket to try and help with a 401k plan. (not to mention the many hours of time). The view changes when you move from striking keys from your home to originating and managing 401K plans for staff that will not use it for the most part Not sure how much most folks would take - we are weary at starting and financing plans and matches for very little gain. I appreciate your perspective and experience. Thanks for sharing it. I have had several friends ask me for retirement savings/planning advice in the past. I spent a lot of hours working with them. Very few have actually done anything at all toward implementing any of the plans. It's frustrating. I can't imagine how bad it would feel it were 500 people instead of 15. The problem is that many (most?) pensions were underfunded due to overly optimistic return projections by those running them. The only solutions are to (1) reduce benefits, which may not be feasible, (2) increase current contributions, or (3) both. 1) Prudence dictates that, if you're going to guarantee something with either the taxpayer or the PBGC as the backstop, you should be conservative when projecting costs for a given level of benefits, eg. assume 75th percentile longevity and 25th percentile returns or something like that. Or, you can lie to yourself or the public about the costs for a given level of benefits by assuming average-or-worse longevity for beneficiaries and average-or-[much-]better returns on investments from the outset. 2) Contracts can be written poorly, either by mistake or on purpose. So make sure there's a way for future beneficiaries to totally invalidate the assumptions baked into your plan with regards to the level of benefits that beneficiaries will receive by 'spiking' overtime over whatever period the salary on which benefits will be based is averaged. 3) Institutional investors have access to index funds with phenomenally low expense ratios from a variety of providers covering more or less all your bases - domestic and international equities, domestic and international nominal bonds, inflation-indexed fixed income securities, real estate, and so on. Eschew this Boglehead nonsense and instead hire some high-priced hedge fund managers to build complex and expensive portfolios that end up under-performing the market. 4) As you mentioned, you can look backward at a recent period of above-historical-average performance and project it forward indefinitely, using this projection to either revise contributions down or revise benefits up; CalPERS [in]famously did this in 1999. 5) During a recession when business income or tax receipts are low, 'raid' the pension fund (either directly with withdrawals or indirectly by omitting or cutting payments into the system). Extra bonus points: guilt trip the next generation about how 'we' (they) can't break promises 'we' (actually we this time) made years before they were born, if they suggest anything other than 'us' (them) paying extra to make up for the shortfall. In individual retirement savings one's own interests are pretty much 100% aligned, there's only a potential gap between the metaphysical 'current me' and 'future me'. Still IMO many people on this forum insist on making what I view as optimistic assumptions about investment returns, and sometimes even insisting on using pessimistic (in terms of living, again optimistic in terms of retirement planning) longevity assumptions, like using Social Sec Admin data, which is for a now quite stratified US population with growing longevity problems in some strata that don't really apply to most posters here. Of course there are also some more conservative people here, particularly on longevity. But the idea you should depress your estimate of expected return for planning purposes from a neutral (and realistic) true expectation *and* raise your estimate of longevity above the median (especially for your own circumstances) is not very common here. Now look at the situation where the interests of pension promise maker and potential recipient are not aligned. Where the promise maker has an interest putting less aside to fulfill the promise as long as things can at all plausibly be presented as OK for now, extend and pretend, and it will turn into somebody else's problem eventually. Is it really a surprise that (sometimes really obviously) optimistic return assumptions are the standard? It's kind of a natural feature of such a system I think. I'm not actually sure why any *gtee* of future payout should ever be given based on a return assumption above the credit 'riskless' curve. The other difference with personal savings is in that case you aren't actually *gteeing* yourself anything. I agree...I tried to help my wife's coworker friend once and put in a lot of time trying to educate her. Answered a ton of questions, pointed her to some great resources (including this place), explained what her 403b and 457b is, fees, index funds, etc. Just to find out a few months later she tells my wife that she loaded up on weight watchers stock because I it just had to go up with the new year (new years resolutions) coming up. The Stanford Marshmallow experiment should be repeated to (most likely) include healthy retirement savings to the other "better life outcomes" of lower BMI, educational attainment and higher SAT scores. Delayed gratification is an impulse control that appears to be more and more difficult in the age of consumerism on steroids. The white suit of privilege is just too irresistible today. It seems many of the posts are really painting other people (non-bogleheads) using a very broad brush. Each person is different and unique. People are just wired differently and this can change at any time. Bogleheads are planners and value saving and retirement higher on their priorities and think others are fools for not doing the same. Some people value health and exercise as the most important and think others are fools for not doing the same. Some people think life it short and value happiness and living the moment and think others are fools for not doing the same. Everyone is right! Also I think Retirement has a negative connotation in that most people think it means Giving up. And it's true to some extent. Many really successful people can retire any time but they continue to work in various capacities. With some exceptions I think many very high earners and high spenders know they can switch gears at any time and "retire" but they don't really value retirement like many on this board because it's so easily achievable. Retirement really has a different meaning for everyone. Last edited by Riley15 on Fri Dec 07, 2018 12:14 pm, edited 4 times in total. Nothing wrong with using a percentage of your earnings, irregardless of salary level, especially for a rule of thumb. Someone making $1M and saving 15% spends the same 85% as someone making $50K and saving 15%. Lifestyle now is going to dictate retirement expenses relatively proportionally. For Bogleheads, rules of thumbs like 'save at least 15% of your gross income' are unnecessary because they understand the nuances and issues at work. But the average person is clueless about such nuance and has virtually zero interest in learning it. So we develop rules of thumb that are likely to be far better than nothing. Keep in mind that the average American is saving about 6% of their gross income. Telling them to save at least 2.5X that much is far more likely to help them than to hurt them. Assuming 5% real returns and 4% withdrawals, a 15% savings rate leads to financial independence in about 43 years. So if a person did that over the course of their career, they'd have a pretty high likelihood of being alright, especially when you add in Social Security. What percent of BHs actually map out a detailed retirement savings plan unless approaching it? In my mid/late twenties I have an investment plan but won’t model retirement anytime soon, I simply save what I can. Currently around 30% gross and always increasing. Lack of education didn't create the problem, education isn't going to fix it. I am also mystified about the calls for education. The article mentions that "only" 16% of high school students are required to take a personal finance class in high school. Where are the results of this massive increase (from 0%) of students taking personal finance classes? Does any Boglehead look around and go "all that education I was calling for has really paid off! Retirement planning is 16% more on track as a country; consumer debt is 16% better; it may not be 100% better but 16% better is a massive improvement!" Or....has there actually been no real world impact on that massive increase in personal finance education over the past 20 years? The answer is that it is trivial to look at actual research on personal finance education and see that it has little to no real world impact. "Thus far, the empirical work doesn't show much of an effect [from financial literacy courses]," says Lauren Willis, professor at Loyola Law School in Los Angeles. "Some findings are that there are negative effects sometimes, presumably because of overconfidence." a 2014 paper from three professors looked at the results from nearly 170 papers covering more than 200 scientific studies on financial literacy and found that financial education did little to improve subsequent financial behaviors. Another recent meta-study found that "financial education has a positive, measurable, impact on financial behavior with an effect size of 0.09". If you think an effect size that small is going to save national retirement for an entire generation, you are kidding yourself. But by all means, ignore the research and keep pretending that education is the answer. When you look at the countries at the top of the Mercer Global Pension Index it isn't the ones with the best personal finance education. It is so funny to say education doesn’t matter, on a forum for financial enthusiasts dedicated to educating and advising people on financial matters. I wonder what you then think about this evidently misguided effort: The John C. Bogle Center for Financial Literacy. The article is mostly okay, but I strongly disagree that the problem is a shift from income to assets, (and I suspect Merton is plugging his financial services). After all you can convert between assets and income. The real problems with pensions in their current form, and the reason they should really be abolished, is that are massively overpromised and are guaranteed. There's no serious plan to fulfill the overgenerous promises, so it falls on other employees and the general tax base to supply the overpromised and guaranteed income. It's not fair that those who don't have these lavish pensions should have to work an extra 5 or 10 years to fund the pensions of those that do have them. The changes that need to be made (short of outright abolition), is that as a society we should say that the pension promises were never valid in the first place, and there should never be guarantees made about income decades in the future. Instead, the payouts should be made from the available funds without any subsidies from the public. It's fine for groups of people to pool their assets and produce income streams while reducing individual risk. But they should make do with the assets they have and not expect subsidies. I don’t k ow how to make heads or tails of this post. Who is working extra to pay for someone else’s pension? Taxpayers and employees. The poster is likely discussing both public pensions and the private pensions that have been taken over by the Pension Benefit Guaranty Corporation. In the case of public pensions, it is the taxpayers. With the PBGC, the pension plans pay premiums in order to participate, you could say that the stronger pensions are subsidizing the weak. I don’t know how to make heads or tails of this post. Who is working extra to pay for someone else’s pension? Seriously? Do you really have no clue about this issue? Your question is utterly cruel. I know personally that my salary if being reduced to the order of several years salary over my career in order to subsidize a pension I am not part of. Pension are really not paid for by employee contributions or employer contributions or investment returns. Those things are a gesture towards contributing, but since the payouts are guaranteed the money simply must be confiscated from all possible sources, and since this is necessary to make guaranteed payouts, there is no need to ensure contributions are sufficient. Since the massive sums of money must be sucked into the pensions they must come out of the pockets of people who have nothing to do with the pensions, in the form of extra taxes, reduced income, reduced or lost work, cut services, increased fees etc. It is financially devastating to be in the catchment area of one of these pensions. The pensions insist in paying out trillions of dollars they don't have. Where do you think that money comes from? See above. In practice the "solution" used is none of those things, since they can just say the payouts must be paid, and can grab it from any and all sources. The real solution is to stop this happening, and insist that the pensions make do with what they have. Nope. I really have no clue on this issue, nor do I believe your post supports a reasonable clue. I do not believe you are I are being fleeced to pay for pension plans that I'm not part of. Where does funding for pensions come from? Well, from private pensions it comes out of profits which come from customers. For public funds, it comes out of taxes. Wages are a matter of supply and demand. Your view is fatalistic and not fact based. Public pensions are underfunded because of this. Most private are not. a) Not contributing (enough or at all). b) raising the benefits because the returns have been so good that new benefits will not cost anything. People struggle with the idea that after you make 12% for a decade, a decade where you make 6% is a reasonable outcome:) I haven't heard of many pensions plans failing cause they made 7% instead of 9% but I am sure that doesn't help. IN the end it all works out to that it is cheap to promise stuff in the future for CEOs and politicians as they are unlikely to be around when the bill comes due. It is probably possible to come up with some type of plan that is stable and gives you a steady 5% or so real return. But you would need someone like the federal government to be big enough and yes you would have to find a way not to raid the reserves after a good 20 years. They are underfunded because they did not adjust their rate assumptions. Defined Benefit: whatever I was promised that's what I get, whether it's more or less than what I contributed. If what I contributed (plus investment returns) comes out less than what I was promised, somebody else has to work to (fully) pay my pension. Pretty straight forward I think. And in practical terms, *who* has to pay (for example taxpayers for promises private corporations made the taxpayers had no voice in) and to what limit (as in states where it's hard to envision promises to public employees being entirely met by the state's taxpayers even though in theory those taxpayers as voters were responsible for those promises)? I'm also assuming here no semantic games where public pensions (including Social Security) are called something else. In reality IMO it's a given that some people will pay in part for other people's pensions, ie some people will get subsidies. It's a matter of degree. On financial education, I think it has its part but it's a limited one. Below the median income (1/2 the people) the idea of saving a consistent % of income is rare, and it's not IMO a matter of not taking a personal finance course. It's a lack of basic belief in the concept, it's cultural, our (US) culture as it is now. Among people who 'could' (in terms of their own perception in modern culture*) save, there's probably more value to pers fin education, but a lot of people in that category can figure it out themselves. *people here can, and might, argue themselves blue in the face how sub-median income people could still save some BH'ish % of income. Mathematically yes, physically yes, culturally today no, by and large IMO. They'd have to be compelled to, or else would not. I understand DC vs DB. I don't understand the OP, or your, comments that people are having a lifetime of earnings impacted by paying for pensions for other people. It's simply not fact. How many private pension funds have gone bankrupt and not been covered by the "insurance" rates paid into the PBGC? Public pensions are supported by tax base. That I can kind of buy. Considering half this country doesn't pay federal taxes, I'm not sure that's a pitty party argument. Well, that's probably true (subsidizing the weak). But that's any insurance policy. Healthcare. Homeowners. Auto. etc. I see that education and saving more are highly important. Howver, I also think we have to take a look at the societal safety net. I have it easy with a pension, good savings, and social security. But, there are plenty of folks out there working hard for pretty low wages that have no health care insurance, maybe not even a 401K. If they have children, then paying for education can be daunting. For better or worse, social security might be their only old age income. So, not everyone lacks discipline to save and educate themselves on finance. A vehicle for longevity income beyond social security and a way to manage health care costs and educational expenses would be a great help. However, society as a whole might have to join in to help fund it. Getting everyone to help in that could be difficult. I'm not convinced the retirement system is broken and needs to be reinvented. If you elect to save nothing, SS will likely provide a subsistence living. If you elect to save, there are several ways to do this. Retirement calculators are not hard to find. . . If you tried to force people to save, many would not be happy about that. Let people decide for themselves. If people want to pay 20% interest on credit cards to buy things they cannot afford, that is their choice. I'm not sure a high school class on money management would help. And, something else would have to come out of the curriculum. When I started working I knew one day I'd have to fund retirement. I had no idea how much money I would need, so I saved 12-15% of my salary. About 10 years ago I started looking more closely at it. I realized if I wanted to retire before 67 I had to increase my savings rate. So that is what I did. I plan to buy an SPIA with some of my savings, that together with SS should provide a reasonable comfortable income for life for me and wife. The rest of savings will be used for fun. For people in the group (A), it usually took a recession and almost total financial disaster before they will change and listen. This is for the lucky few that did survive from the disaster. For others, there was no recovery. You've been in the U.S. far too long to think that a large percentage of people starve to death here every time there is a recession. A big part of the problem is people living above their means, and making bad investments. A three fund portfolio, with the bonds part in a tax sheltered account, can do most of the heavy lifting....... Businesses often focus on containing costs and reducing overhead wherever possible.....people should consider the same strategy. Often times a winning strategy is one that starts off more aggressive when one is behind, and get progressively more conservative as the extended trading period continues, this means to me invest heavily and aggressively in youth. More in US stocks, more in stocks than bonds, and greater percentage contributions. Pay off your house, pay off your debts, tighten the belt, as every penny wasted in youth that is not invested is ten pennies wasted in retirement. Personally I cram about 20% of my gross income into retirement and the rest into real estate. There is a lot to be said for owning a home.....if you can own a home by retirement every payment on the home gives you equity and eventually you wont have the high rent overhead.... and there are some tax advantages for home owners. The person paying rent gets no equity.....they may be more mobile for switching jobs, but they get zero equity, if they don't go after another job in another location and end up staying where they are then its money thrown away. The frugal retiree with a tiny pension and social security can make their 401ks and IRAs last a lot longer........Interestingly enough this means that early in life saving automatically and often and living frugally to do so is vitally important.......later in life frugal living determines how fast the principle gets eaten up by withdraws. If one makes mistakes with their money during the middle period of their life without touching their IRA or retirement investments they may be essentially better off than someone who made perfect decisions but started investing later on in life. Last edited by Benjamin Buffett on Fri Dec 07, 2018 2:30 pm, edited 1 time in total. I think there's a difference between providing a wealth of information to those who want it, which Bogleheads does wonderfully, and mandating that people sit through classes. My employer makes people sit through classes, and it appears to be a complete waste of resources. It's not like people don't already have access to all the information they could ever want, for free, on the web. If they haven't taken enough interest to look at it on their own, making them sit through a class won't help. That and everyone already knows they should save. The reasons they don't save aren't due to a lack of knowledge. Yeah, I'm always puzzled by the "lucky few" comments. I mean, the lucky few is like 300M people. Being someone that spends time interacting with middle income or lower income Americans because i am one, i can attest to the fact that the overwhelming large percentage of them will be trying to get away from you if you talk about budgets, personal finance, or investing. If i talk to smokers and tell them how their $2600 a year habit can turn into $260,000 after 28 years of compounding at 8% annually, they will likely change the subject. Trying to educate them how their eating habits can contribute to obesity or heart disease doent interest them either. Telling people the wisdom of driving used cars instead of a $600 truck payment and how that can compound over time is something else that doesnt interest them. In their defense, i know that my drinking and the food that i eat can affect my life expectancy, but good old fashion discipline, not education is going to change my behavior. The real problems with pensions in their current form, and the reason they should really be abolished, is that are massively overpromised and are guaranteed. There's no serious plan to fulfill the overgenerous promises, so it falls on other employees and the general tax base to supply the overpromised and guaranteed income. Pretty straight forward I think. 1. I understand DC vs DB. I don't understand the OP, or your, comments that people are having a lifetime of earnings impacted by paying for pensions for other people. It's simply not fact. 2. How many private pension funds have gone bankrupt and not been covered by the "insurance" rates paid into the PBGC? Public pensions are supported by tax base. That I can kind of buy. Considering half this country doesn't pay federal taxes, I'm not sure that's a pitty party argument. 1. It might have helped if you'd been less cryptic to begin with: 'can't make head or tails'. You mean you don't agree with certain statements or implications in the post it seems, not that you can't make head or tails of it. 2. I don't know about OP, but I made clear my statement encompassed all pensions. Social Security is a pension, and some people are definitely paying other people's Social Security benefits. But as I also said, I don't see that that is realistically entirely avoidable society wide. For private corp and public employee pensions it would be nice if history up to now was a good predictor of the future. But since in fact these issues, the second more than first, involve a huge flock of chickens on their way home to roost, the swarm clearly visible though not at the roost yet , I don't find your statement that this is 'simply not a fact' too comforting. Has not broadly been a fact so far. In fact, PBGC's deficit narrowed to only $50bil this year. But the demographic wave is just getting rolling. That's what we call 'ironic'. There's a big gulf between saving 15% or more of one's gross income into a half-way decent investment vehicle (e.g. target date fund) and mapping out a complete retirement withdrawal strategy. Saving gives you a supply of ammunition that you can later determine how best to deploy and when. Plenty of states and companies have zero unfunded defined benefit liabilities. Why don't you move to another state or another employer if you are convinced your "salary is being reduced to the order of several years salary over your career" whatever that means exactly. Also your blanket assertion that "Pension are really not paid for by employee contributions or employer contributions or investment returns. Those things are a gesture towards contributing, but since the payouts are guaranteed the money simply must be confiscated from all possible sources" is in my opinion a significant overstatement. 47% of households have no retirement accounts of any kind. 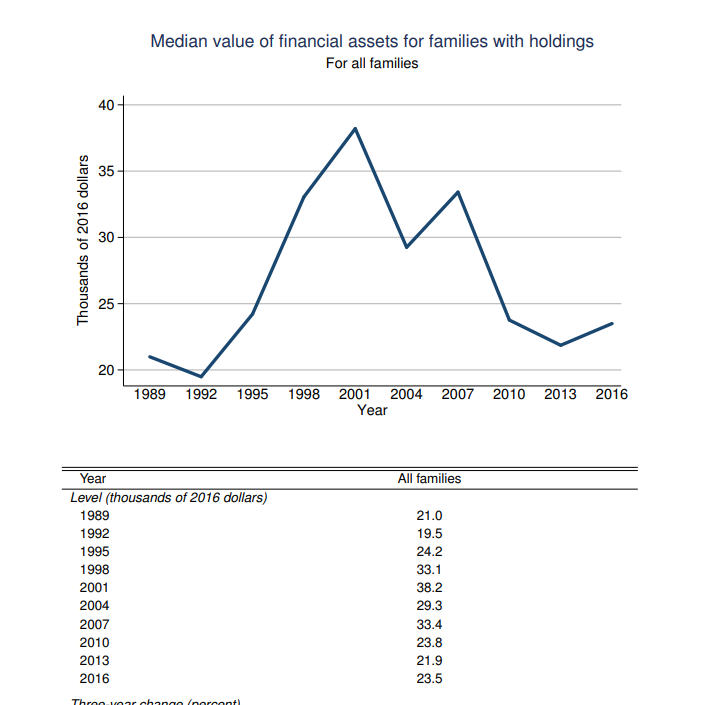 The median US household had financial assets (checking, savings, CD's, retirement and non-retirement investment accounts) totalling $23,500 in 2016. I don't know what the solution is but the IRA/401-K model to amass wealth adequate to bankroll decades of retirement isn't working outside of little enclaves like this place. A lot of it is probably cultural. The OECD website shows 27 countries with a higher savings rate as a percent of GDP than the U.S.
1) << This is the philosophical difference between. B) Save first and spend later. The full text of my post. What do you think happen to folks that live paycheck to paycheck and had been unemployed for a while? 2) Which USA do you refer to? This is after 10 years of bull market. Do you think that it will get better in a recession? I agree 100%. Any seven year old can learn basic personal finance in an afternoon. It's a spending problem, nothing more. William Bernstein, in, "If You Can" says simply: "People spend too much money". The issue is the volatility of returns. How can you issue a promise to pay X when you can’t account for sequence of risk? What is the formula for that? Bankruptcy to make good on a promise with unlimited cost? The simple answer is that annuity companies manage to do precisely that, and while making a living for themselves at the same time. Can't you imagine a very large annuity company operating at cost and with the lowest risk of default ? If you can't here's a hint: its "CEO" is elected every 4 years. Sure and annuities do it by having crappy returns. Pensions work with ~8% assumed returns. Annuities returns are long bonds(3-4%) level. That makes a tremendous difference in the amount that needs to be saved. Could you run a pension plan that didnt have a way for make ups(larger employer contributions) backed up by some insurance product? Maybe. But I have a feeling those insurance rates would be pretty high(2%/year?). Aren't annuity rates about 7% at Vanguard (after 65) (before inflation). Aren't they good enough? I'm considering using at least a portion in an annuity. If you don't plan to leave anything to your heirs, it's the most secure option. Sure but annuity payouts are not returns. And real annuities are far safer than nominal ones. When running Firecalc I die with somewhere between $2 million and $0 at age 90. There has to be a better way to provide for the elderly. Especially for those who spent there life making $20/hr or less. Last edited by burt on Fri Dec 07, 2018 7:09 pm, edited 1 time in total. There are no guarantee's in life except death and taxes. Not recommending it for all of your assets, but you can buy a series of SPIA’s so that you are guaranteed to receive X dollars each month until you leave for your next destination. The remaining amount you can use for legacy. I agree, and I don’t think it requires a dollar cut-off. We see all sorts of individuals from different occupations struggle with planning for retirement. There are too many bad influences out there looking to separate you from your benefits and assets. Social Security is not a pension plan. It’s an insurance plan, as stated right in the name. Last edited by Bacchus01 on Fri Dec 07, 2018 8:24 pm, edited 1 time in total. I understand what you're saying. Funding retirement through saving and investing involves risk, and that creates a lot of uncertainty about how retirement will play out. But we do have one mechanism that does not rely primarily on saving and investing--Social Security. For the most part, Social Security is simply an ongoing transfer from current workers to current retirees. Some adjustments for demographics is necessary, but that's second order. So perhaps the solution to the retirement problem is to expand and modify the Social Security system so that more people can comfortably retire on it. By 'comfortable' I mean at a level of consumption somewhat close to what they had during their working years. Saving and investing can still be employed to achieve earlier or more comfortable retirements. Social Security is not a pension. It’s an insurance plan, as stated right in the name. Those can be the same thing. It doesn’t make it a pension plan and it wasn’t intended as a pension plan. It was intended as an insurance plan to prevent abject poverty for elderly unemployable people. Those can be the same thing. It doesn’t make it a pension plan and it wasn’t intended as a pension plan. What's the definition of a pension plan? Most people will disagree, but i know several middle income retirees who are living on social security alone and are just fine. They paid their homes off while they were working and lived frugally. They actually have enough money that they are able to donate 10% of their social security check to their church and also build up their checking for future emergencies. They don't touch their nest egg and plan to leave it to their children unless they need long term care. There are people who make modest salaries and live happy lives on social security alone. If you live in a low cost of living area and go to church, you probably know one of these people. I agree. The retirement system is not broken. It does not need to be reinvented. I don't see a problem except these unfunded public pensions, which should gradually be replaced by 401k type plans. I guess this is happening, but at a much slower rate than the private sector. My MiL has been living off SS almost exclusively for years now, but she's very frugal. Owning her home outright has certainly been the ticket to making it work. If she does any 'extraordinary' spending on things like travel, she must pay for it from her savings. Living on SS is possible, but there's no disputing that doing so will require a significant spending reduction for a great many who will be forced to do so. Using the 'quick calculator' on the SS website, a person who earned $40k annually in today's dollars long enough to max out their credit will have a monthly benefit of $1,200 if they start benefits at age 66. Worst case, their spouse gets 50% of that as well, so $1,800 monthly. That's $21,600, or 54% of their prior gross income. If their home is paid off by that time and they don't have any other debt, they'll probably be able to make ends meet, but it will be tight. Still, this example illustrates that people in this situation don't need to save 25% of their income for 30 years in order to have a successful retirement. Having 'just' 5X their household income (i.e. $200k) and using a 4% withdrawal rate would increase their retirement income by 37%, which would be a huge help. Most people will disagree, but i know several middle income retirees who are living on social security alone and are just fine. While we have significant assets, when I draw SS at age 70, and DW draws on my record, we should have enough from SS alone to cover our expenses. The exception, of course, would be if one or both of us end up in a nursing home. If people would claim at age 70, their standard of living would be a lot higher. I know some people cannot due to health or not being able to find and hold a job, but I know a number of people who could but decided to bail at 62. So if you take SS at 62, don't come whining about your standard of living. We hope to be in a similar situation. Despite being a single-earner household, if we defer benefits until age 70, 70% of our estimated SS benefits would cover our current essential spending. As such, our retirement savings are for (1) bridging the 15 year gap between retirement and starting SS benefits, (2) discretionary spending in retirement, and (3) a backstop for unexpected financial needs (e.g. long-term care). Willthrill, it seems we are both in similar situations and have the exact same plan. We plan to spend down some of our assets, bridging the gap until taking social security at 70. When i am doing projections of our expenses and income, i can see where if in need, we could live on social security alone and i could be happy. Can't say the same for my wife though.☺ Taking social security at 70 gives you a way bigger check than taking it at 62 and it is indexed for inflation forever. Seems better than any annuity i've seen. I agree that if one has the means to defer until age 70, it seems like the preferred move. Inflation-adjusted annuities are indeed rare these days. But of course, there's a lot of time for changes to be made to SS, and even if the current system remains intact, we might want to begin benefits earlier if the markets treat us very badly. But at least we have a plan and a backup or two. Retirement isn't broken. We just have a lot of broken people that don't want to save for retirement. I agree that if one has the means to defer until age 70, it seems like the preferred move. Often it doesn't come down to having the means. Many people could keep working until 70 if they want to, but chose to retire at 62. You can call it whatever you want but it's still a public old age pension. All rich countries have them. The US one simply happens to have been given that particular moniker.